Kelli Garner as Margo and Ryan Gosling as Lars in a scene from the film Lars and the Real Girl. 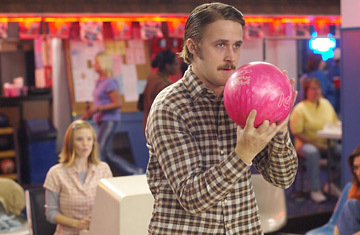 Ryan Gosling's chemistry with his latest leading lady is palpable. "She showed up at the read-through, and I couldn't take my eyes off her," confesses the Canadian actor of his Lars and the Real Girl co-star, a soulful, half-Danish, half-Brazilian newcomer who goes by simply "Bianca." "I found her endlessly fascinating. She's got beautiful little freckles. I would look forward to our scenes together. I was relaxed when she was on set."